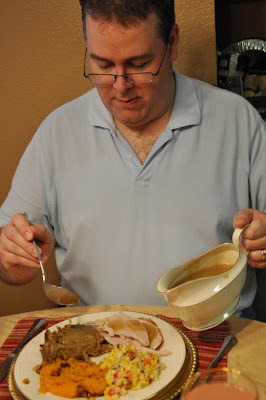 Savor The Days: Gobble! Gobble! Stuart and I always make a full Thanksgiving spread, even back when it was just the two of us. Now there are four and the 2 little ones don't really care what we eat. But we still stayed up way too late last night (or is that this morning?) preparing a full Thanksgiving meal. We could have slept later this morning but with little kids in the house that is a foreign concept to us. We eventually got the bird in the oven and finished up some last minute details for our big dinner. While we were puttering around in the kitchen, the kids did a great job of playing together on their own. Well, I thought so until I realized that Rachel had been standing on TOP of her play kitchen! So to keep my wild little Indians entertained (and safe! ), I printed off a turkey template from DLTK and put them to work writing down what they are thankful for. I loved hearing about some of the things they were thankful for. We cut out all of the pieces and put them together to make little turkeys of gratitude. Nicholas listed that he is thankful for music, a roof, trees, TV, God, food, a DS (Nintendo, that is), my family, and Legos. Rachel is thankful for stop signs, chicken, my play kitchen, my family, my big brother, pink baby, animals, and turkey. Speaking of turkey....it's done! We always use the Alton Brown Good Eats Roast Turkey recipe. It uses a brine so there is some prep the day before but it's easy and oh, so worth it! We even got out the charger plates, china, and crystal to do it up right. We are thankful for our health and our families. We are thankful for our home and our jobs which provide our home and put this delicious food on our table. We are thankful for determination and willingness to try new things. We are thankful for the laughter in our home. We are so thankful for hugs from our children! But we are most thankful for those that have gone before us, who followed their dreams and their destiny to fight for freedom and the making of this great nation.